Using the right humidity, correct temperature, nutrient-rich soil/Super Soil will be worthless if you have not used the high-quality seeds. It’s like the foundation of the good harvest has a loophole. All your efforts would turn into a complete waste. So, if you are a San Diego Grower License, below listed are some of the essential techniques that will help you to identify the correct seeds for avoiding any loss at the harvest time. The color of the healthy seeds distinguishes them from the rest of the lot. The most healthy or viable seeds usually look like brown, tan, or black while other seeds are light in colors such as white, yellow or pale green. You can also place the seed inside two fingers to check its resilience. Poor quality seeds crumble or break under even a low pressure when applied. While high-quality seeds withstand this minimal pressure very easily. Seeds which are symmetrical or teardrop in shape are considered to be the high-quality seeds. Other seeds are usually irregular and small in shape and size respectively. Newly harvested seeds are often the most viable form of cannabis as seeds degrade over time like any other genetic material. Store your seeds in the cool, dark place for maintaining its viability for the longest time. If you are still unsure about the quality of the cannabis seed, float test is one of the simple and easy ways to find the match. Fill a drinking glass with water, preferably distilled or spring water. Place the cannabis seeds over the surface. The seeds which will be found floating on the water are mostly the low-grade seeds, while the ones that have sunken below are healthy and high-quality seeds. If you are not a commercial cannabis grower but a medical marijuana grower in San Diego, the one option to check the viability of seed is to germinate it. If the seed does not transform even under the right conditions, it was not healthy, to begin with. Cannabis growing itself requires a lot of understanding. Moreover, that alone is a very tedious job to start. Mostly, it becomes impossible to understand the type of strain just by looking at the seeds. You might confuse between the genetics. So, you have to solely rely on the information provided by the budtender or the manufacturer. Therefore, it becomes very essential to purchase seeds from a reputed company or seeds banks, especially the ones equipped with client support services. This will help you to troubleshoot your issues concerning cannabis seeds or growing. It is advisable to go for the right feminized strains or you might end up with hermaphrodite cannabis strains. It takes a minimum of a year of experience to understand what all is required for improving the yield. So, go slow with the procedure, and gradually learn the process. 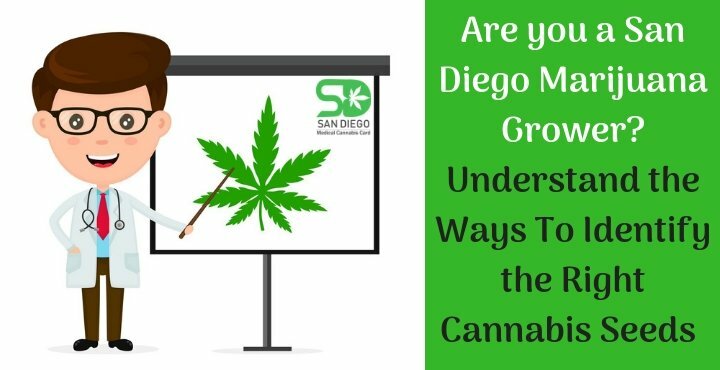 Also, if you wish to increase your grow limit, get your recommendation for San Diego Grower License to avoid any legal formalities afterwords.